2018 #GivingTuesday is NOVEMBER 27th. For more information about this national event, visit www.givingtuesday.org. In order to participate in #GivingTuesday 2018, your organization MUST BE an AMADOR COUNTY nonprofit. All participants must complete the #GivingTuesday APPLICATION (obtained from ACF) and email it to acf@amadorcommunityfoundation.org no later than October 7th, 2018, along with your logo. (Note – In order to fill out the form online, you must open it in Adobe Acrobat). We will have a MANDATORY MEETING to get toolkits to you and brainstorm how to make the most of this national day of giving (dates to be determined). Sign up now to earn incentive dollars on #GivingTuesday! All participating AMADOR COUNTY Nonprofits will be listed on the DONATE NOW page. Only 501(c) 3 nonprofit organizations that have completed all registration and examination of good standing with the Internal Revenue Service, Secretary of the State of California, and Amador Community Foundation are eligible to participate in Amador Giving Tuesday. Gifts may be of any size. No minimum requirement. Incentive funds will be provided based on the total size of the incentive pool, number of qualified nonprofits participating and the total of donations made on this website during the designated 12-hour period. Donations may also be made by cash, check, or credit/debit card at the GiveAmador Charity Meet & Greet on November 27th from 4:30pm – 6:30pm. The incentive pool for 2016 was $10,000 granted by Amador Community Foundation, Helen Fallis Endowment. 2017 incentive pool was $35,000. This year, the incentive pool is $40,000…see details here). Donors are encouraged to make gifts to multiple organizations of their choice. Each gift to a different organization will be counted to a maximum of $5,000 per charity per donor. Credit and debit card donations received during the 14 hour period (6:00 AM PDT to 8:00 PM PDT on November 27, 2018) are eligible to receive a boost from the Incentive Pool, per the structure outlined above. Checks and cash will ONLY be accepted if they are HAND DELIVERED to our offices at 571 Highway 41, Jackson, CA 95642 (in Motherlode Plaza behind Jose’s Restaurant) between the hours of 9:00am and 4:30 pm ON NOVEMBER 27, 2018 or at the GiveAmador Charity Meet & Greet on November 27, 2018 from 4:30pm – 6:30pm. No other cash or checks will qualify for matching funds. MasterCard, Visa, American Express and debit cards will be accepted for this event. Secure donations for Amador Giving Tuesday are processed through PayPal for each donor entering their own credit card information directly on Amador County Giving Tuesday donation page . Any third party who enters credit card information on behalf of a donor, by their actions of entering any such credit card information on behalf of a donor, has signified their donor’s agreement with the Amador Giving Tuesday sponsoring organizations 1.) to assume all risk of loss and any liability associated with such transaction and 2.) to indemnify each of the sponsoring organizations of Amador Giving Tuesday against any and all risk of loss and any liability associated with such transaction. 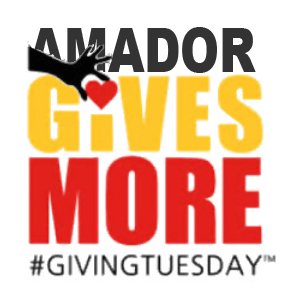 Participating nonprofit organizations will receive access to their own donor information after Amador Giving Tuesday unless the donor has specified to remain anonymous. Each nonprofit should receive one (1) check totaling all donation(s), minus the credit card processing fees, plus any Incentive Pool funds, no later than December 31st, 2018.